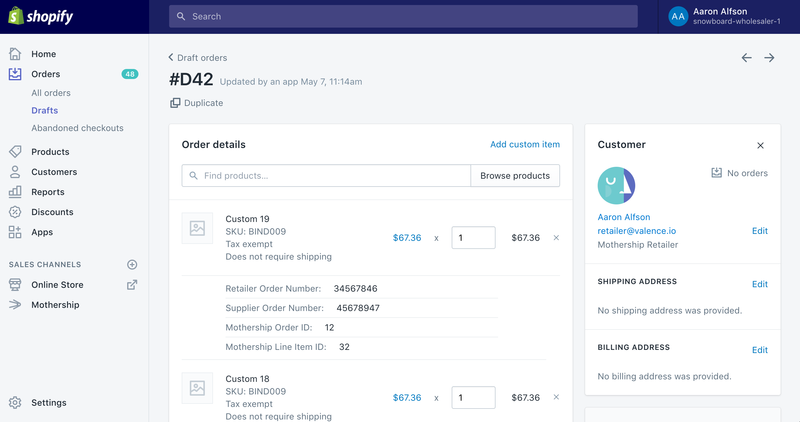 Mothership uses your Shopify checkout to invoice your retailers for the orders they place in your store. Retailers can be invoiced on a per-order or a 1, 7,15, or 30-day periodic basis. There are subtle, but important differences in how Mothership handles per-order and periodic invoicing. We strongly encourage you to read the relevant sections below to gain a full understanding of how they work. Invoices are created as draft orders and reflect the pricing you specify in the product catalog to which the retailer is assigned. Depending on the frequency with which you invoice a particular retailer, Mothership sends a link to a pre-filled checkout that the retailer uses to pay for their orders. Since Mothership relies on your existing Shopify checkout, you do not need to integrate with an additional payment service provider. You select a retailer's invoicing frequency when you invite them to connect with you on Mothership. If you are entering into a partnership with a retailer with which you have no prior history, it is recommended that you keep the default selection of "Every Order". If and when you become more comfortable with the partnership, you may choose to invoice them on a periodic basis. You can easily change the invoicing frequency for a retailer on the retailer's configuration page in Mothership. This is the default frequency to invoice a retailer and is listed as "Every Order" in the image above. 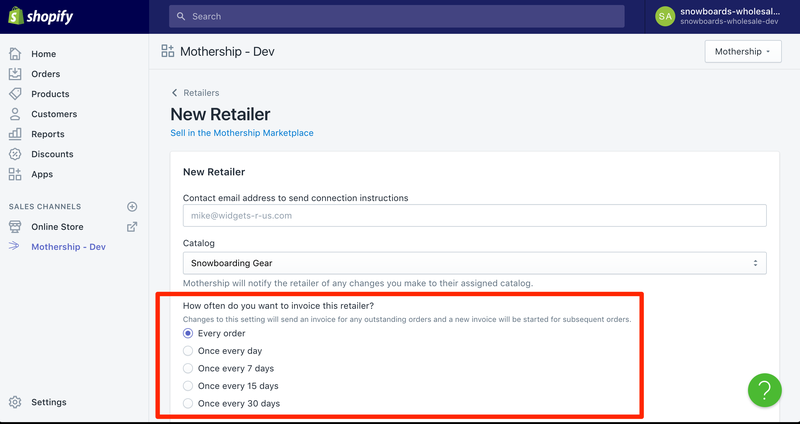 When this option is selected, a draft order is created in your store whenever Mothership receives an order from the retailer containing products that you supply to the retailer. Mothership applies custom line-item discounts and custom shipping rates in order to reflect the pricing you offer through the product catalog to which the retailer is assigned. After Mothership creates the draft order, it emails a checkout link to the retailer. 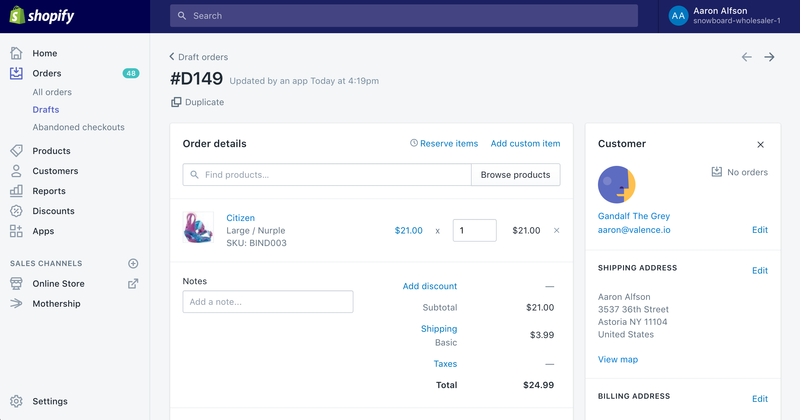 Once the retailer pays for the order, it appears as an regular order in your Shopify admin panel, ready for payment capture and fulfillment. Mothership refers to this order as a customer order. With per-order invoicing, the draft order becomes the customer order once the retailer completes the order checkout. It is important to note that the retailer must pay for the order before it is placed in your store. Since draft orders do not reserve inventory, it's possible that a retailer may not pay for an order before items on the order go out of stock. If this happens, you will need to modify the draft order to remove the sold out items. Finally, the order's shipping address will be the end-customer's shipping address, while the customer and billing address fields will be the retailer's. Refunds are processed the standard way. You may want to invoice higher-volume or more established retailers on a periodic basis. You can choose to invoice your retailers every 7, 15, or 30 days. When a periodically-invoiced retailer places an order through Mothership, the app will automatically place an order for those items in your store and mark the order as being paid. This order is called a customer order, since it contains the shipping address for the end-customer. As with per-order invoicing, you fulfill and refund the customer order in the same way you do any other order. Separate from the customer order, Mothership creates a draft order with custom line items. This draft order is called an Invoice Order. Each line item on the invoice order corresponds to a line item on a customer order. Unlike draft orders created in a per-order invoice process, invoice orders can contain line items from more than one customer order. In other words, the invoice order is used to keep track of all of the charges the retailer has incurred during the period of time specified by the invoice settings. Importantly, an invoice order is used to manage the financial component of the transactions between you and the retailer - it does not affect inventory. Invoice orders can be in a draft, pending, or closed state, depending on whether the invoice is still open, has been sent to the retailer for payment, or has already been paid. While an invoice is still open, it's draft order looks like the one below. While an invoice is open, Mothership will automatically update the draft invoice order to include the line items and shipping charge from new orders placed by the retailer. Note, each line item specifies the supplier order number as the customer order with which it is associated. Additionally, the price on each line item reflects the price for the item as specified in the product catalog that the retailer is assigned to. Lastly, as visible in the second picture below, invoice orders are identifiable by the "Mothership Invoice Order" tag. Once an invoice has expired, Mothership will email a checkout link to the retailer where they can pay for the items on the invoice. You can close an invoice early by clicking on the "Mail Invoice" at the bottom of the draft order page. Once the retailer pays for the invoice, the draft order is converted to a regular order in your Shopify store. Since we don't want the closed invoice order to be processed in any way, Mothership will automatically capture the invoice order's payments, mark the order as fulfilled, and archive the order. Since this order is for financial purposes only, you will want to ensure that any fulfillment processes, shipping services, or accounting applications take that into account. Finally, refunds are made on the customer order and then automatically applied to the invoice order. While the order is in an open or pending state, refund line items are added to the draft order to reflect the change in the order total. Once an invoice order is paid, standard Shopify refunds are used to apply refunds originating from customer orders.